[T]he distinction between fast and slow technology is… a metaphorical distinction that has to do with time presence. When we use a thing as an efficient tool, time disappears, i.e., we get things done. Accepting an invitation for reflection inherent in the design means on the other hand that time will appear, i.e. we open up for time presence… Hallnäs and Redström (2001) Slow Technology – Designing for Reflection. Personal and Ubiquitous Computing, 5, 201-212. An attempt to clarify what I think we do in the graduate program in Critical & Creative Thinking at UMass Boston. I think we can claim to prepare students for the roles just above the edge of the red oval, but not for the two MOVE roles across the top. Moreover, I don’t think the Program can or should compete with organizations and people who focus on the MOVE mode in government, corporations, consulting, and education. iii) address problems around moving students through to completion and reinforce guidelines to prevent those problems in the future. v) clarifying and strengthening CCT’s role in the College. B. To establish planning parameters that allow CCT faculty to determine the best use of their experience and energies and adjust operations to work within those parameters. C. To contribute to increased cross-program collaboration in the GCE. D. To contribute to increased collaboration with and contributions to other units within the University. The goals and associated objectives became the basis for the Program’s self-study as part of the 2002-3 AQUAD review of CCT (described in the next section), and again in the 2010-11 review (currently in progress). The 2002-3 AQUAD review was seen as an opportunity to resolve the long-standing uncertainties about CCT’s status in the College and University. The self-study I coordinated was, by all accounts, exemplary. (Indeed, I hoped it would be seen as a contribution to “documenting process, product, and evaluations to make institutional learning more likely.”) The external review was very favorable, recognizing “the leadership in innovative multi- and inter-disciplinary pedagogy represented by this Program,” but restoration of resources for CCT did not match the priorities of the College or the Provost. Post-AQUAD proposals the Program has explored have been many. With respect to service, what is important in these and subsequent proposals is that I continued to take initiative and respond constructively to possibilities floated by administrators, and did so in the context of continuing uncertainty about the institutional status of and resources for CCT. Through all this, I also continued to seek a secure planning frame in which to recruit M.A. students and offer courses (as evident in the Annual Program reports and options for the future outlined in the current AQUAD review). Of the proposals listed above, the one that has born most fruit has been the partnership with the Division of Continuing Education (CCDE; now University College) that began by promoting the 15-credit CCT graduate certificate with a marketing focus on “Creative Thinking at Work.” (This focus subsumed the popular “Dialogue and Collaboration in Organizational Change” focus I had built up since Summer 2000 once I saw the history of CCT efforts and student demand in that direction.) The partnership agreement required CCT to develop several online sections so that students could, in theory, complete the certificate from a distance. 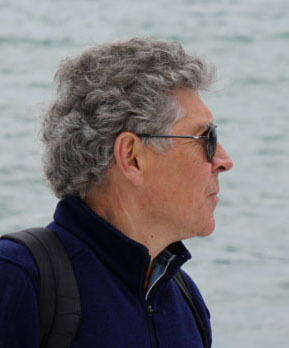 I recruited faculty who could teach these sections in ways consistent with CCT’s tradition of innovative and interaction-intensive teaching and each semester I shepherded the instructors through the shoals of getting online courses up and running and their full complement of students on board. This partnership has grown to a level where U.C. supports (since January 20110 a full-time professional staff member (with teaching responsibilities) for CCT and a half-time staff member for the new Science in a Changing World track. Gradually the work training these assistants is paying off in terms of sharing the administrative load with them. 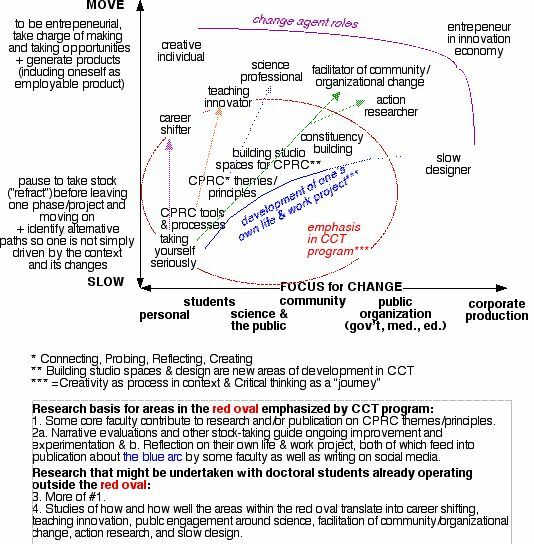 organizing, in a sustainable fashion, personal & professional development, community building, and educational-innovation activities beyond the formal CCT program of studies. supplementing students’ education through the involvement of alums. continuing alums’ education by their involvement in the education of students and each other. The richness of the Network events is evident in the podcasts, especially the “Our Lives and Other Worlds” series, in which graduates come back to explain their work and reflect on how this has developed in relation to their CCT experiences. Another direction of development in CCT has been Science in a Changing World, first as a wikispace documenting a range of projects, and then as a cross-college graduate track formally within CCT, as described above. A theme “let your life speak” emerged clearly during a session on “Engaging with diverse adult populations,” for which three graduates of the Critical & Creative Thinking Program were asked to reflect on the development since they graduated of their work and thinking around the theme of the session. The outward-looking theme—engaging with people who are different from you—turned out to be paired with the inward-looking theme of finding an authentic path for oneself. Before trying to make sense of this outward-inward connection, let me set the scene with some notes from the session. The first speaker, a community-college professor of English as a Second Language, described the evolution of his doctoral research project, which aims to shed light on the divergent post-secondary educational paths of Sudanese refugees in the Boston area. A colleague challenged him to explain what he will give back to the Sudanese community through this research. The speaker admitted to having been taken aback by this question. I thought the question was appropriate; indeed it is a standard question to ask of any researcher going out into the field to study other groups. Yet the speaker’s response made sense to me when he said, “I’ve always worked with refugees.” He has a long record of committed teaching and service at his College. He knows where his heart is, even if it took the probing question to make him articulate that. The second speaker revisited experiences growing up and in jobs before starting the CCT Program that involved disability access, international dot.com startups, and adult education. He explained that his time in the Program had allowed him to understand that he wasn’t happy unless he was involved in looking a the deeper qualities of people, ones that might not be obvious or might not be obviously relevant to the ostensible task at hand, but would turn out to be meaningful. Meaningful for people especially in the sense of enabling them to be present—to get to a place where their voices could at least be heard. That might involve disability access that is not limited to the minimal standards prescribed by ADA regulations, or recognition by American managers that “non-compliance” to their guidelines by their foreign associates is more a matter of cultural style than shirking of work. The third speaker, a Diversity officer at a Boston-area college, spoke of strategic partnering—collaboration, facilitation, dialogue—to keep colleagues working across difference and to support students in their differences (gender, racial/ethnic, disability, etc.) so they were less likely to drop out. A key reflective question for partnering, the speaker noted, is what is key to who we connect with and who we don’t. Acknowledging what was key was something he associated with his CCT experience. The Program had been a “studio” for him to experiment with the things he was passionate about—that was OK in CCT where it had been hard in his education and upbringing. The result was, quoting Parker Palmer’s Quaker dictum, he was able to advocate letting your life speak. My hypothesis about the integration of inward and outward angles of view that emerged in the session on engaging with diverse adult populations follows in the next post.